When America gets it right and I get it wrong…well, it’s hard to be upset about that. 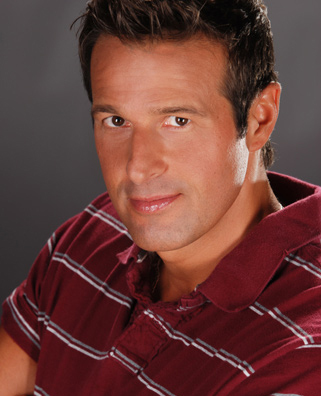 The man they call “Teflon Tim,” Tim Urban, was eliminated during last night’s Idol Gives Back charity event. My own rankings had Tim at the bottom almost every week on American Idol this season–including this week. Even so, I felt his Teflon-mojo would slide him through another week. The other big story last night was the appearance of Casey James in the Bottom Two. I wrote about this yesterday, saying Casey would take a big hit with Idol voters. I happen to dig the blues-rock that Casey’s been churning out week after week. He’s consistently good, and his performances generally go on my iPod the next morning. But in the Idol-verse, here’s the problem. Casey’s song choices look lazy and repetitive–like he’s not progressing. Never mind that what that what he’s doing he’s doing very well. Viewers (and the judges, from the feedback they’re giving) want to see other “layers.” The solution: do some more ballads, like his recent heartfelt “Jealous Guy,” or take a page from the David Cook playbook and surprise us by re-inventing a well-known song. Casey’s needs to show some other sides. Or else the opportunity to be in the Top 5, which I feel he deserves, will slip through his guitar-virtuoso fingers. Other than that, a tip of the hat for bringing back Idol Gives Back. With the show being a cultural phenomenon, American Idol is in a unique position to really raise awareness (and money) on the issues of children in poverty, world hunger and malaria. It’s the kinda thing only Idol could pull off on this scale. And it’s cool that they choose to do it. That said, might I suggest that the time to alert viewers that the broadcast will run over-time would be the night before, not an hour into the night of. Grrrr. That’s two nights this week I’ve had to go hunting on the web for the material my DVR didn’t record because Idol went too long. Or maybe that’s their revenge on us for skipping through the commercials. Hmmm. Topic for a future blog, perhaps. Seems like Songs of Inspiration Week would be the perfect time for the Top 7 to step things up on American Idol. Well, with only a couple exceptions, there wasn’t much “climbing the highest mountain, swimming the deepest ocean” going on last night. Inspired was the choice in mentors, though. Alicia Keys! A true artist assisting on the season with the largest number of finalists who seem to know “who they are” as artists. 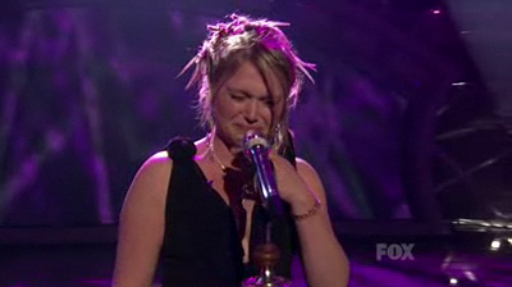 1) Crystal Bowersox – “People Get Ready” by Curtis Mayfield – So, why was this the standout performance of the night? Was it because Crystal broke into tears at the end of the song (photo)? No. But that doesn’t hurt her cause. Crystal’s kept her emotions under wraps all season. So much, you have to wonder if Idol voters believe Crystal even wants to win. When the report came out this week that Crystal almost quit the show a couple weeks ago, I’m thinking most Idol fans said, “Yeah, that sounds about right.” Never has there been a front-runner who seems so reluctant. A sign that all this matters is what the audience wants to see from Crystal. So the tears last night were a good thing. So was losing the guitar. The instruments, whether it’s her frequent acoustic guitar or the piano a couple weeks ago, have unintentionally been another barrier between Crystal and the audience. And looking ahead to the finale, where she’d be performing three songs, Crystal’s going to need to mix things up (maybe a song on guitar, another on piano, the other as front-woman sans instrument). So it was a big night for “Mama Sox.” But why was it the standout? Because it sounded the best. An effortless greatness that also was the most inspirational. 2) Lee DeWyze – “The Boxer” by Simon & Garfunkle – This was something special. Lee continues to make inspired song choices. One of his best performances this season. And as my girlfriend said last night, Lee is “getting cuter and cuter.” I suspect that means the Idol stylists are doing their jobs, the makeover tweaks preparing Lee for a possible finale showdown with Crystal. But I’m not saying that’s a done deal. A big part in determining who makes the finals is popularity (naturally). There’s five weeks of competition between now and then. Still time for others up their games, make fans, and earn votes. 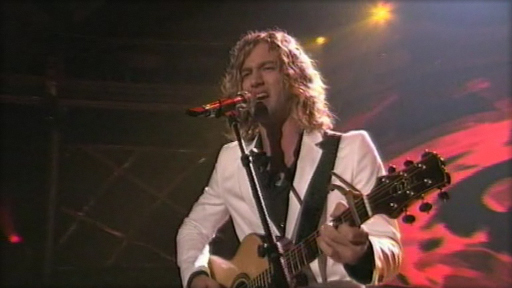 3) Casey James – “Don’t Stop” by Fleetwood Mac – I think Casey’s gonna take a hit this week with Idol fans. Yes, Casey critics, I agree with you. We’ve heard the song Casey did last night several times this season. Yeah, the song has a different name. But it’s basically the same song, right? Well here’s the deal. Casey was full of energy and joy and sounded great (again) last night. Sure it was another missed opportunity. Casey would benefit from another ballad moment like his “Jealous Guy.” And Inspiration Week would be an obvious time to pull that off. But despite its not being what we were hoping for, Casey’s “Don’t Stop” simply out-shined the four less-inspired efforts listed below. 4) Aaron Kelly – “I Believe I Can Fly” by R. Kelly – Looks like Aaron Kelly has a new strategy: sing songs by artists with “Kelly” in their names. Next week, some Kelly Clarkson? I say this song with too big for Aaron’s voice, and another in an increasing long list of “hacky” song choices. But Aaron still has a voice I like listening to. He’s going to sound great in the studio. Not crazy great last night. But on a night with few home runs, this effort put him solidly in the middle of the pack. 5) Michael Lynche – “Hero” by Chad Kroger featuring Josey Scott – When they said Big Mike was singing “Hero,” I was like, “Which one?” There’s, like, 50 songs called “Hero.” So, it was the Spider-Man song. I’m cool with that. Simon Cowell wasn’t. But c’mon, Simon. What’s more inspiring than Spider-Man? And in those months after 9/11, I remember our audience really responding to this song when we played it on the radio. Anyway, Big Mike’s version was just OK. From the way it started, I thought he might take it in a “Seal” direction. Maybe “Kiss From A Rose” the song up. I think Mike should’ve done exactly that, instead of retaining the original’s rock structure. To my ears, Mike didn’t have the fullness of voice to pull it off. 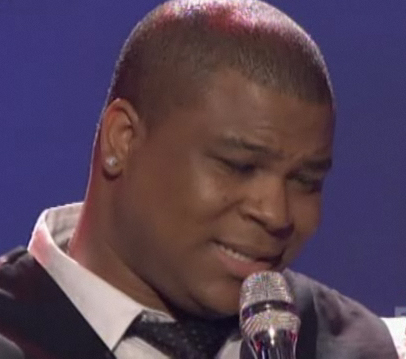 But I am impressed that Big Mike has a “playbook,” a list of songs he’s been keeping in case he ever made it to Idol. That shows a desire to win that we haven’t been seeing from front-runner like, well, Crystal. 6) Siobhan Magnus – “When You Believe” by Whitney Houston and Mariah Carey – Gotta give Siobhan props for guts. Idol contestants don’t usually do well singing Whitney songs. Or Mariah songs. Siobhan did the one that’s by both! Here’s the best way I can explain what Siobhan’s problem is: during her song last night, she hit an especially bad note, then immediately followed that with one of her best. That inconsistency and unevenness sums it up. Siobhan has a big voice. But the way she uses it isn’t always pleasing to the ears. Sometimes I love what I’m hearing. Other times not. And lately, it’s been both of those in the same song. Ultimately, I can’t put half-satisfying performances on my iPod. Siobhan has got to put it all together. So, how will things go down tonight? It’s a week ripe for surprises. Before I pick a Bottom Three, let me say who won’t be in it and why. 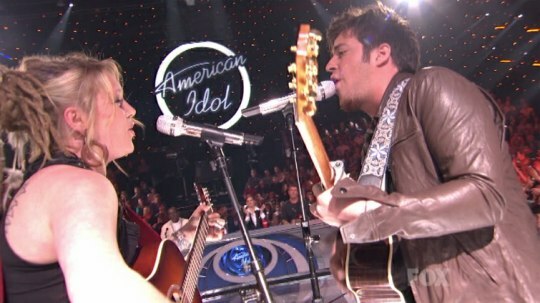 Crystal Bowersox and Lee DeWyze, because, well, duh! Also Siobhan Magnus and Tim Urban. Their fans have bought tickets to ride their respective trains. Those people are now “invested” in Siobhan and Tim, regardless of their weekly performances. And the numbers of those fans are big. So, here’s what I’m feeling. In the Bottom Three: Aaron Kelly, Michael Lynche and…Casey James. Casey gets sent to safety. And between Big Mike and Little Aaron, Michael Lynche gets the ax. 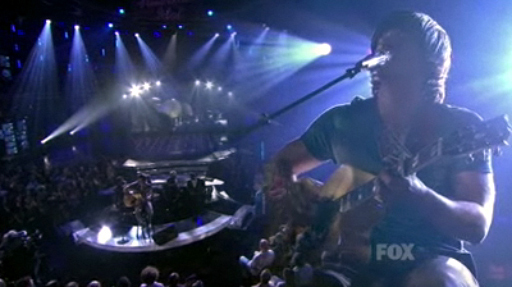 It’s definitely getting harder for DVR freaks like me to speed past the commercials on American Idol. In between ads disguised as part of the show for Clash of the Titans, and Ford, we did actually get some results last night. Didi Benami was “ushered” home, and now seeks an answer to the very question she sang Tuesday night: What becomes of the brokenhearted? Well, for starters, there’s the Idol concert tour. Didi will be part of that. But traditionally, tenth-place finishers don’t go on to massive recording careers. Hey, sometimes Idol winners have trouble selling albums. Enter Ruben Studdard, who performed early in the show last night, a new song called “Don’t Make ‘Em Like You No More.” While Ruben, Season 2’s champ, is far from Idol‘s most successful victor, he’s not it’s least, either. Taylor Hicks, ears burning? Ruben’s song was clearly designed for the Urban AC (Adult Contemporary) radio format. And while I’m not rushing to iTunes to download it today, it seemed to be a respectful effort for his audience. And kudos on the whole health thing. “The Velvet Teddy Bear” has shed some pounds and gone vegan. There was also news last night of an upcoming concert tour featuring Ruben and and Season 2’s runner-up Clay Aiken. Ummm…good times, great oldies? Also on the bill last night was this week’s mentor, Usher, who performed (a little out-of-breath) “OMG” with will.i.am. And joining the festivities later was Diddy, who was simultaneously humble, gracious, over-the-top and a great salesman, with his new thing (group? project? ), Diddy Dirty Money. Backed by a couple female singers, and a huge crew of dancers, everybody dressed in white and surrounded by smoke, they did a song called “Hello (Good Morning)” and America went looking for their pagers, blurted out “Waassssuuuup” and enjoyed a collective 90s flashback. As for the Bottom Three, that went as I suggested yesterday: Katie Stevens, Tim Urban and Didi Benami. Katie being sent to safety. And between Tim and Didi, Tim dodging yet another bullet, and Didi Benami going home. Tim’s got a little Diddy in him–the salesman part. Or maybe he’s more politician. They keep asking Tim, a seeming “resident” of the Bottom Two, why he always smiles. Same reason any person running for office who’s 30 points behind in the polls smiles to their followers: to inspire some confidence, to make people feel they’re not wasting their vote, and to make they feel they’re part of something. Well, during Idol, there’s always another election coming. And it’s less than a week away. Thoughts today?